With an online master's in health informatics degree, students prepare to pursue careers as knowledgeable information and data professionals in clinical and medical fields. In the modern information age, doctors, nurses, and other healthcare professionals increasingly depend on health informatics experts to store, retrieve, and process medical data. With a steady demand for qualified health informatics experts, a master in health informatics can help individuals fill the demands of the profession. Due to the increased push for medical organizations to go "paperless," the need for skilled informatics professionals remains high, as does the need for quality educational programs. What Is a Master's Degree in Health Informatics? What Can You Do with a Master's Degree in Health Informatics? Online Master's in Healthcare Informatics Degree Program Ranking Guidelines: We selected these programs based on their quality, courses offered, faculty, rankings, awards, and reputation, including the school's reputation for effectively providing online degrees. A private research university in Stanford, California, Stanford University is known for its wealth, academic strength, and proximity to Silicon Valley. Stanford consistently ranks as one of the top universities in the world. In 1885, Stanford was founded as a nondenominational, coeducational institution. Stanford offers a variety of undergraduate and graduate programs for students, including many online options. Students interested in biomedics and biology can pursue an online master of science in biomedical information. The program includes clinical informatics, bioinformatics, and public health informatics, focusing on methods relevant to basic biology. The core curriculum for the program requires training in the following four areas: core biomedical informatics; social and ethical issues; electives; and computer science, statistics, mathematics, and engineering. Students must complete 17 units in biomedical informatics; 18 units in computer science, statistics, mathematics, and engineering; four units in social and ethical issues; and electives. For the 45-unit program, students typically take 3-5 years to graduate. Students must complete their master's program within five years of their start date. Applicants should demonstrate a strong background in computer programming, calculus, statistics, biology, linear algebra, and physiology. Stanford University is regionally accredited by the Accrediting Commission for Senior Colleges and Universities of the Western Association of Schools and Colleges (WASC). A public research university in Chapel Hill, North Carolina, the University of North Carolina at Chapel Hill functions as the flagship of the 17 campuses within the University of North Carolina system. After its charter in 1789, the university began enrolling students in 1795. Chapel Hill identifies as one of the three oldest public universities in the United State and was the first public institution of higher learning in North Carolina. Today, students enjoy a variety of program opportunities in both undergraduate and graduate studies. Online students can pursue a master of professional science in biomedical and health informatics. The online master's in health informatics program at Chapel Hill is highly interdisciplinary, granting students knowledge and skills in managing clinical and large-scale projects in health information systems, evaluating and developing health information systems to impact both healthcare quality and clinical decision making, and managing and analyzing health data to improve clinical practice. The program also offers part-time and accelerated options. Students can enroll in as little as one course each semester and still graduate in a timely fashion. Students who take at least two courses each semester can finish the program within two years. Students in the accelerated option can earn their master's degree in one year if they commit to a full-time schedule, taking 12 credits of coursework each semester. The program features two tracks, allowing students to choose the path that best suits their career goals and personal interests. Students can concentrate their program on either clinical informatics or public health informatics. The University of North Carolina at Chapel Hill is regionally accredited by the Southern Association of Colleges and Schools Commission on Colleges (SACSCOC). Located in Baltimore, Maryland, Johns Hopkins University is a private research university. Established in 1876, Johns Hopkins is the first research university in the United States. The variety of undergraduate and graduate programs, including several online options, is among the reasons Johns Hopkins is often cited among the top universities in the United States. Students interested in biotechnology and engineering can enroll in the online master of science in bioinformatics. Available fully online, the bioinformatics program features spring, fall, and summer start dates for students. To graduate, students must complete 11 courses, with a curriculum that features rigorous focus areas in biosciences, computer science, and other areas of bioinformatics. The program immerses students in applied methods and topics of molecular biology, computational modeling, systems biology, genomic sequencing, and proteomics. Graduates of the program hold the educational foundation necessary to analyze sequence data using advanced bioinformatics software and program software when needed. Coursework covers complex topics including molecular biology, the marketing aspects of biotechnology, and advanced cell biology. Many students in the program already work in the bioinformatics industry and want to advance their careers. A public research university in Seattle, UW boasts a 703-acre campus with 500 buildings. Offering both undergraduate and graduate degrees, UW features programs across 140 different departments. Students can pursue a variety of online programs including an online master of health informatics and health information management. Students pursuing an online master's in health informatics at UW complete their program prepared to lead in the rapidly growing field of health information technology. Through its unique curriculum, students develop the leadership skills they need to manage large organizations and develop deep domain expertise in health information management and health informatics. The curriculum structures itself around five pillars: healthcare data analytics, health information systems, information governance, health systems leadership, and patient and organizational information privacy and security. Students can earn their online master's in health informatics in as few as 18 months at UW. Students must meet once a month for class at a UW facility in the Overlake area of Bellevue. In addition to the monthly in-person sessions, students participate in weekly webinars. Applicants to the program must hold a bachelor's degree from an accredited college or university, preferably in information technology, business, health information management, or health informatics. They must also hold a 3.0 minimum GPA, submit a completed admissions application, provide a current resume, submit a written statement and three letters of recommendation, and provide all prior transcripts. UW is regionally accredited by the Northwest Commission on Colleges and Universities (NWCCU). Established in 1851, Northwestern University, located in Evanston, Illinois, is a private research university offering undergraduate and graduate programs. Home to a variety of online programs, students who want to learn to optimize data used to improve community health can pursue an online master's in health informatics. The online master's in health informatics program prepares students for emerging roles and opportunities across the healthcare enterprise. Students can choose one of the three specialization options featured in the program: health technology informatics, health administration informatics, and clinical informatics. Students who pursue the clinical informatics specialization focus on preparing for board certification in medical informatics. To graduate, students must complete 12 courses. The curriculum covers different course topics depending on the student's chosen specialization. Students who specialize in clinical informatics cover topics including decision support systems and telecommunication networks. Health technology informatics students focus on topics such as global health systems and techniques of analytics and health administration. Informatics students focus on topics like global health technology and data science. Applicants must submit a completed admissions application with a $75 application fee, transcripts, two letters of recommendation, a statement of purpose, and a current resume. Online students should review the technology requirements for the program to ensure they meet all of the necessary standards before they apply. Northwestern University is regionally accredited by the Higher Learning Commission (HLC). Known around the country as a top-ranked public research university, the University of Minnesota, Twin Cities is the oldest and largest campus in the University of Minnesota system. The university boasts the sixth-largest main campus student body of any higher learning institution in the United States. Offering a variety of undergraduate and graduate programs, the university highlights several online options including an online master of health informatics. In the master of science in health informatics online program, students complete 31 credits of coursework with 18-24 credits in major coursework and 7-13 credits outside their major. The curriculum covers a variety of topics, including population health informatics, biostatistics, and clinical informatics and patient safety. Students can complete the program in as little as one year with a full-time schedule. The program also features a part-time option for students who require more flexibility. Medical students at the university can pursue a joint degree, allowing them to also pursue health informatics. The University of Minnesota is regionally accredited by the Higher Learning Commission (HLC). Established in 1898, Northeastern University is a private research university in Boston, Massachusetts.The university offers both graduate and undergraduate programs at its main campus and exclusively offers graduate programs through its satellite campuses in Seattle, Washington; Charlotte, North Carolina; and San Jose, California. Students can pursue a variety of online programs including an online master of science in health informatics. Students have the option to enroll in their health informatics program full or part time, depending on their availability. Many students in the program work full-time jobs and pursue an advanced degree to expand their career opportunities and increase their earning potential. Full-time students usually finish the program in about two years, while part-time students take approximately three years to complete the degree. Students must complete three required core classes, two business management courses, two health informatics courses, two technical courses and two electives. Coursework covers relevant topics including design for usability in healthcare, biostatistics in public health, and data management in healthcare. The program functions through co-op, providing master's students with up to 12 months of professional experience to help develop awareness, perspective, confidence, and knowledge to develop rewarding careers. Graduate students usually complete an experiential work opportunity following their second semester. The experience could exist as a three to four month summer internship or a 6-8 month co-op. With more than 34,000 undergraduate and graduate students, Boston University serves students from more than 130 countries, boasts 17 colleges and schools, and highlights over 300 programs of study across three campuses. There are many online programs for students who need additional flexibility for their education. Students can pursue degrees such as master of science in computer information systems with a concentration in health informatics. In the health informatics program, students learn about different health electronic applications and how to process, collect, and store data. Students leave their program with a strong knowledge of computer networks, biomedical databases, and data communication. The program places an emphasis on privacy components and data security, ensuring students understand how critical those elements are regarding medical data. Students learn about electronic health records and health information technology and gain experience with the latest medical technologies. The rigorous curriculum covers a variety of topics, such as IT strategy and management, information systems analysis and design, and business data communication and networks. Students must complete five core courses worth 20 credits and five concentration courses worth another 20 credits. Applicants to the program must hold a bachelor's degree from an accredited institution. Boston University is regionally accredited by the New England Commission of Higher Education (NECHE). The health informatics program is fully accredited by the Commission on Accreditation for Health Informatics and Information Management Education (CAHIIM). USF is an American metropolitan public research university in Tampa. The fourth-largest public university in the state, USF is a member of the State University System of Florida. The system features three campuses with 14 colleges and more than 200 undergraduate and graduate programs. Among them is a master of science in health informatics degree. The university boasts a top-tier medical school and a fully online program, affording students maximum flexibility as they pursue their degree. Coursework in the online program addresses both operational and technological aspects of informatics, focusing on interoperability and integration of technology. Students learn to assess and develop the tools used to represent medical data. Graduates of the program leave prepared to take on a variety of high-paying careers such as chief medical information officers, health informatics directors, and compliance officers. Students must complete 32 credits of coursework in order to graduate, including 12 credits of core courses, 14 credits of required courses, and six credits of elective courses. The curriculum focuses on a wide variety of topics, including healthcare project management, health data management, e-healthcare ethics, and managerial communications. Applicants to the program must submit their completed admissions application along with a $65 application fee, a current resume, transcripts (with a 3.0 minimum GPA), two professional or academic letters of recommendation, and a statement of purpose. The University of South Florida is regionally accredited by the Southern Association of Colleges and Schools' Commission on Colleges (SACSCC). A private research university in Washington, D.C., The George Washington University was chartered in 1821 by the United States Congress, making it one of five universities with a congressional charter. Students can pursue undergraduate, graduate, and online degrees at the university, including a prestigious online master of science in management of health informatics and analytics. Online master of health informatics students experience a renowned curriculum and program at GWU, equipping them with the skills and knowledge they need to thrive in the health informatics field after graduation. Students work to bridge the gap between the healthcare industry and medical technologies. Throughout their coursework, students analyze, collect, and translate various forms of data being generated from the latest technologies. Students can enroll part or full time depending on their scheduling needs and desired level of flexibility. Full-time students can complete the program in as little as two years and part-time students might take as long as four years to graduate. Students must complete 45 credits of coursework. The curriculum includes ten online courses taught in eight modules and two on-campus immersion sessions. The culminating activities also include a capstone course requiring students to develop a practical solution to a problem using informatics. The eight modules include topics like healthcare management and strategy, population and community health analytics, and health law and policy. The George Washington University is regionally accredited by the Middle States Commission on Higher Education (MSCHE). UCF has more students enrolled than any other college or university in the United States. In addition to its large size, the university consistently ranks among the top for value and quality of education. Featuring 13 different colleges, the university offers more than 220 programs, including an online master of science in health management and informatics. Health informatics graduate students learn to integrate technology and healthcare, developing the tools needed to positively impact patient outcomes and healthcare. Students expand their knowledge base and enhance their skill set to explore more advanced career opportunities and higher pay brackets. Graduates of the program can find work as practitioners, managers, researchers, and analysts. The program features an entirely online format, affording students the maximum level of flexibility. Students follow a cohort format, staying on track with the same peers throughout their program. This format allows for more networking opportunities and a greater chance for collaboration. Applicants do not need to take the GRE or GMAT exam to gain admission. They must complete an admissions application, provide their official undergraduate transcripts with a 3.0 minimum GPA, submit a goal statement indicating how the program will enhance their career goals, and provide a current resume. Brandeis University in Waltham, Massachusetts, was founded in 1948 as a coeducational, nonsectarian institution sponsored by the Jewish community. The 235-acre campus sits in the suburbs of Boston. Students can pursue a variety of online programs including an online master of science in health and medical informatics. Students in the program work alongside professionals interested in advancing their health informatics careers. The program encourages students to implement and build IT solutions to improve healthcare outcomes, use healthcare analytics to help guide informed decisions, and create policies to ensure the security and privacy of patient data. The part-time format requires students to complete 30 credits of coursework, completing six required courses and four elective courses. The rigorous curriculum covers a variety of topics including clinical business issues in health informatics, data analysis and decision support for health informatics, and health data and electronic health records. The health informatics program at Brandeis prepares students for a number of prestigious careers in the field. Graduates work as medical informatics managers, life sciences analysts, and software training specialists. Graduates often find employment at organizations including Novartis, Bayer Corporation, and Partners Healthcare. Brandeis University is regionally accredited by the New England Association of Schools and Colleges (NEASC). Florida International University is Miami's public research university, offering nearly 200 degrees. The university provides south Florida's only public schools of medicine and law. Students interested in integrating information technology and healthcare can enroll in the university's online master of science in health informatics and analytics. In the online health informatics program, students enjoy a fully online curriculum that can be completed in 14 months. Students participate in a cohort format limited to 40 students, where they complete the same courses at the same times as the other students in their group. This format allows students to build a unit of collaboration with one another and cultivate professional relationships through networking. The curriculum covers topics such as clinical information systems, quality and outcome analytics, and healthcare data visualization. Students also must participate in professional development seminars. Applicants must hold a bachelor's degree with a 3.0 minimum GPA, submit a completed admissions application, undergraduate transcripts, a professional resume, a statement of purpose, and two professional or academic letters of recommendation. If students complete their undergraduate coursework in a related field, they do not need to provide GRE or GMAT scores. Students who meet all other admissions requirements but do not have undergraduate experience in a related discipline must provide their GRE or GMAT scores. Florida International University is regionally accredited by the the Southern Association of Colleges and Schools Commission on Colleges (SACSCOC). The University of South Carolina, located in Columbia, operates as a public research university with seven satellite campuses throughout the state. The main campus sprawls over 359 acres in Columbia, located near the South Carolina State House. The university offers several online degree options to afford students the flexibility they need to earn their education, including an online master of health information technology. In the online health information technology program, students focus on developing expertise in how healthcare is administered, financed, and monitored, gaining hands-on experience using technologies and innovative tools to improve healthcare. The curriculum covers a variety of relevant topics including financing of healthcare, health systems analysis and design, telecommunications for health information systems, and approaches and concepts for health administration. For online students, the average class size is 20 students, allowing students full access and one-on-one interactions with their instructors. Students can enroll part or full time depending on the level of flexibility they need within their program. Part-time students typically complete their program within two years, while full-time students usually graduate within 18 months. Applicants to the program must submit a completed admissions application, undergraduate transcripts from an accredited institution with a 3.0 minimum GPA, GRE or GMAT scores, two letters of recommendation, and a goal statement and current professional resume. The University of South Carolina is regionally accredited by the Southern Association of Colleges and Schools Commission on Colleges (SACSCOC). A private, nonsectarian research university located in Coral Gables, Florida, the University of Miami features 12 different colleges and schools, offering almost 140 undergraduate degrees, nearly 150 master's degrees, and 68 doctoral programs. Students can also pursue a variety of online options. Students interested in capitalizing on the growing demand for experts in healthcare informatics can enroll in the university's online master of science in health informatics. In the university's health informatics program, students the skills and knowledge they need to perform the essential roles in the healthcare industry regarding electronic healthcare record systems. The 22-month program covers an in-depth curriculum, reviewing topics such as health information exchange, information security, and project management. Students must take 11 courses comprised of 33 credits in order to graduate. Courses last seven weeks and students can only enroll in one course at a time. Applicants to the program must submit their completed admissions application, complete and submit an academic profile, submit letters of recommendation and official transcripts, and provide GMAT or GRE test scores. Some students might need to submit additional admissions materials and should work with an admissions adviser to ensure they meet all of the necessary criteria before submitting their admissions application and supplemental components. The University of Miami is regionally accredited by the Southern Association of Colleges and Schools Commission on Colleges (SACSCOC). Located in Clinton, Mississippi, Mississippi College functions as a private Baptist college. Founded in 1826, the college is the second-oldest college with a Baptist affiliation in the United States. Additionally, it holds the spot for the oldest college in the state of Mississippi. With over 5,000 students, the college comes in as the largest private university in the state. Students can pursue both undergraduate and graduate programs, enjoying several online opportunities including an online master of science in health informatics. In the online health informatics program, students complete a rigorous curriculum covering a variety of topics, including research methods and procedures, health data management, legal aspects of healthcare administration, and integrated electronic health records. Students learn to help organizations reduce healthcare costs, expand patient access to high quality care, and improve and maintain the quality of services by making sure that health information gets delivered in an organized, timely manner. Applicants to the program must submit an admissions application along with the $35 application fee, official transcripts, and GMAT or GRE scores. Students need to reach out to an admissions adviser to clarify any additional admissions requirements they might need to adhere to before submitting their application materials. Mississippi College is regionally accredited by the Southern Association of Colleges and Schools Commission on Colleges. Founded in 1949, the University of San Diego functions as a private Roman Catholic research university. The university began as a college for women, merging into a private university in 1972. Today, the university offers nearly 80 undergraduate and graduate programs, with many online options available for students who desire a more flexible program. Students can pursue an online master's degree in healthcare informatics. Students in the healthcare informatics program typically take around two years to earn a degree, completing 37 credits of coursework. Careers in the healthcare informatics field typically require hybrid skills combining healthcare experience with information technology experience. The innovative, fully online program develops students' skills in leadership, health system management, and strategic planning. The program was designed for professionals from both healthcare and information technology backgrounds who want to learn how to blend the two areas into one and advance their career opportunities while simultaneously raising their salary potential. The 37-credit curriculum covers a broad base of knowledge, preparing students with the skills and knowledge they need to thrive in their careers after graduation. Course topics cover things like strategic planning and management of health systems, advanced healthcare information management, and systems analysis and design for healthcare informatics. The University of San Diego is regionally accredited by the Accrediting Commission for Senior Colleges and Universities of the Western Association of Schools and Colleges (WASC). With a campus nestled where the Rocky Mountains meet the Great Plains, the University of Denver is a private institution created with foundations of exploration through collaboration and research among students, educators, and global and local communities. The university boasts nationally recognized programs and takes on a bold and rigorous approach to education. Students can pursue many different online programs including an online master of health leadership with a concentration on health data informatics and analytics. The health informatics program allows students to function at the forefront of the health industry, comprised of all the leadership and technical skills they need to thrive in the rapidly growing informatics field. The program features ten-week terms, and students who enroll full time can complete their program in as little as 18 months. The curriculum requires students to complete 12 courses for a total of 48 credit hours. Students must complete five core courses, six concentration courses, and one elective course. Course topics cover a range of important subjects, including healthcare database applications, healthcare ethics and biostatistics, and healthcare project management. Students can work with an academic adviser to get help selecting electives that align with their career and personal goals. Graduates can pursue a variety of high paying career opportunities, including business analytics directors, analytical strategists, and clinical informatics managers. Based in Fairfax, Virginia International University was established in 1998, making it one of the nation's newer colleges. It offers a variety of programs, including degrees in education, business, computer information systems, and professional development. As of 2017, VIU enrolled around 1,400 students, including students from Asia, Africa, Europe, and the Middle East, earning its "international" moniker. The school merges computer information systems and professional development through its online master's in health informatics program, which allows professionals to earn a degree relevant to current trends while working full time. The program delivers all of its 36-credit, 12-course curriculum asynchronously and never requires students to visit campus. All students complete core coursework in general areas like IT infrastructure; analysis, data, and modeling; and enterprise information systems. The program's health informatics concentration consists of five courses chosen from seven options, including biostatistics, healthcare economics, and healthcare data management. The program typically requires two years of full-time study to complete. Full-time students in VIU's School of Computer Information Systems take three classes each semester. Most students complete a career planning course during their final semester to prepare for the workforce. Virginia International University is regionally accredited by the Accrediting Council for Independent Colleges and Schools (ACICS). Located in Lynchburg, Virginia, Liberty University earns a spot among the largest online schools in the world. Currently, over 100,000 students take classes through Liberty. Many of those students only take online courses and never visit campus. The university's student body includes individuals from more than 80 countries and all 50 states. Liberty's slate of distance learning offerings includes over 400 programs, including one of the best health informatics master's programs online. Differentiating itself from some other schools, Liberty awards a degree in health informatics rather than a degree with a health informatics concentration. The program requires students to complete 36 credits, which typically takes two years of full-time study. The curriculum includes foundational courses such as health policy and ethics, database design and development, health systems and delivery, and advanced IT project management. The curriculum culminates in an integrated capstone course that blends all of these topics. Liberty aims for intimacy and affordability in its online programs, maintaining a 17-to-1 student-to-faculty ratio. Approximately 88% of students at Liberty -- both online and on campus -- get some sort of financial aid. The school enrolls more than 30,000 military students and offers tuition discounts and other benefits to military members and their families. The health informatics program's tuition rate has not changed in three years. Liberty is regionally accredited by the Southern Association of Colleges and Schools Commission on Colleges (SACSCOC). A private college affiliated with the Jesuit congregation of the Roman Catholic Church, Regis University operates its central campus out of Denver, Colorado. The Society of Jesuits opened Regis near the end of the 19th century in New Mexico to provide a Jesuit-centered education to the American Southwest. Since then, the school experienced several iterations, eventually landing on the current version of Regis University in the 1990s. Regis earns nationwide renown for its distance learning offerings, including one of the nation's strongest master's in health informatics online programs. The College of Computer and Information Sciences requires students to complete a 36-credit curriculum to earn the health informatics degree. The curriculum includes courses such as healthcare performance evaluation, information systems concepts, and secure enterprise management. It concludes with a capstone applied research project. All students complete either an information technology and healthcare services track or a data science track. The program delivers all coursework asynchronously without in-person or on-campus requirements. To apply, prospective students must submit evidence of a 3.0 undergraduate GPA in addition to an essay and two letters of recommendation. Regis strives for affordability, awarding over $134 million in financial aid during the 2017-18 school year. Regis University is regionally accredited by the Higher Learning Commission (HLC). Based in Tempe, Arizona State University consistently earns a place among the largest universities in the nation for undergraduate enrollment. The school offers a variety of distance learning degrees, including a master of science in health informatics online. Delivering all coursework asynchronously without in-person requirements, the healthcare informatics program requires degree seekers to complete a 10-course, 30-credit curriculum. Notable courses include population health management and analysis, fundamentals of health analysis, and health informatics database modeling and applications. The program delivers this material through accelerated courses that span 7.5 weeks. Students benefit from the opportunity to conduct research alongside faculty members, as ASU spent over $9 million on research expenditures during the fall 2016 semester. Applicants need a bachelor's or master's degree in a relevant field with a minimum 3.0 GPA during their final 60 credits. Applicants must also submit two letters of recommendation. The school offers multiple start dates throughout the year and charges the same tuition regardless of residency. ASU is regionally accredited by the Higher Learning Commision (HLC). When the University of Missouri opened in the city of Columbia in the mid-19th century, it held the distinction of the first college west of the Mississippi. Renowned nationwide for its journalism school, the university also earns acclaim for its distance learning programs, which include a health informatics master's degree online. The health informatics program at MU runs on a blended learning model, requiring students to visit campus in Columbia to complete certain intensives in the 33-credit curriculum. The program delivers the rest of its coursework asynchronously without in-person requirements. The curriculum covers essential healthcare informatics topics, such as data warehousing, data mining, health data analytics, information architecture, and the U.S. healthcare system. The program typically requires two years of part-time study to complete. The program's degree completion plan requires students to complete 1-2 courses each semester -- including summers -- to graduate on time. Catering to working professionals, MU's online healthcare informatics program requires applicants to boast three years of professional experience. The school offers a military tuition award to qualifying online students. Based out of Ruston, Louisiana Tech University is lauded for its research programs, collaborating with big names such as NASA, the Department of Defense, and the National Institutes of Health. Established at the turn of the 19th century, Tech now offers several of its programs online, including an online master's in health informatics. Tech's health informatics degree in the College of Applied and Natural Sciences offers several features that appeal to working professionals. The program delivers all coursework asynchronously through Moodle, allowing students to access lectures at their convenience through Echo 360 software while working full time. Students never need to visit campus to earn their degree, and all online students pay in-state tuition. The program's curriculum consists of 45 credits, including foundational courses, such as database architecture, clinical information systems, and computerized decision support. The curriculum concludes with a capstone research project. In many cases, students can fold these projects into the research interests and pursuits of faculty members in the Department of Health Informatics and Information Management. Louisiana Tech University is regionally accredited by the Southern Association of Colleges and Schools Commission on Colleges (SACSCOC). The health informatics program holds national accreditation from the Commission on Accreditation of Health Informatics and Information Management (CAHIIM). Based in the eponymous borough of Slippery Rock, SRU was established at the turn of the 20th century and maintains a relatively small student body of less than 10,000. In recent years, the public university expanded its distance learning offerings and now provides an online master's in health informatics without in-person requirements. The health informatics program delivers all coursework asynchronously. Full-time students who enter in the fall semester can graduate within 10 months, though they may also enroll in the spring or the summer. The curriculum includes courses such as data mining and data analysis, health services administration, and big data analytics. All students complete an internship and a capstone project that includes original research. Applicants need a minimum 3.0 undergraduate GPA. Applicants who do not meet this threshold can seek conditional admission. The program does not require applicants to submit GRE scores. Out-of-state graduate online students at Slippery Rock pay in-state tuition. Slippery Rock University of Pennsylvania is regionally accredited by the Middle States Commission on Higher Education (MSCHE). The health informatics program meets the accreditation criteria of the Commission on Accreditation of Health Informatics and Information Management (CAHIIM). Located in Fairfax, Virginia, George Mason University maintains a national reputation as a commuter school. In the past decade, the school added distance learning to its reputation, offering a master of science in health informatics online. Mason's health informatics program delivers all coursework asynchronously, without in-person requirements. The program's curriculum consists of 39 credits, including data mining in healthcare, advanced statistics in health services research, and advanced health information systems. Students with significant undergraduate experience in healthcare informatics can sometimes place out of two introductory courses. The curriculum concludes with a practicum experience in a real-world healthcare informatics setting. Students typically complete the program in 22-28 months. All online students pay in-state tuition rates regardless of residency. Applicants need a 3.25 undergraduate GPA and basic skills in programming and mathematics. The program does not include work experience as a prerequisite, but it bolsters a candidate's application. George Mason University is regionally accredited by the Southern Association of Colleges and Schools Commission on Colleges (SACSCOC). Mason's health informatics master's program holds national accreditation from the Commission on Accreditation of Health Informatics and Information Management (CAHIIM). Based in the town of Henrietta in the titular metropolitan area of Rochester, New York, RIT was established at the turn of the 20th century as a marriage of a literary society (Rochester Athenaeum) and a technical school (The Mechanics Institute). Today, the school maintains a reputation of strong STEM-related programs. The school also excels in distance learning, offering one of the nation's strongest master's in health informatics online programs. Catering to working professionals, RIT's online health informatics program delivers coursework asynchronously and eschews in-person obligations. The program's curriculum consists of 30 credits, including core courses, such as introduction to medical informatics, foundations of human-computer interaction, and clinical decision support. It also includes a practicum experience. Students choose an analyst or a clinician track. No matter the track, the program typically takes 18-24 months to complete. Applicants need a bachelor's degree with a minimum 3.0 GPA. Only applicants who attended international universities need to submit GRE scores. In some cases, the program's admissions committee interviews candidates to supplement the information on file. As a private university, RIT offers the same tuition regardless of residency. RIT is regionally accredited by the Middle States Commission on Higher Education (MSCHE). Established at the turn of the 20th century to educate working-class citizens in Philadelphia, Temple offers several distance learning programs, including an online master's in health informatics. Temple's health informatics program delivers coursework asynchronously. The program's part-time structure allows students to keep full-time jobs and earn their degrees within two years; 96% of students graduate in 27 months. The 30-credit curriculum allows students to choose a concentration in cybersecurity for healthcare professionals, healthcare data analytics, or population health management. The program requires one on-campus intensive, delivering the rest of the curriculum online. The program boasts a strong job placement rate, with 82% of graduates finding work within a year of graduation. Applicants need a bachelor's degree with a minimum 3.0 GPA. Applicants must also submit GRE scores in the 50th percentile or higher. The program accepts students in the spring and fall semesters. Temple is regionally accredited by the Middle States Commission on Higher Education (MSCHE). Temple's health informatics curriculum meets accreditation criteria set by the Commission on Accreditation of Health Informatics and Information Management (CAHIIM). Founded in the early 20th century, East Carolina University traditionally served the North Carolina Greenville area as a primarily regional school. The school expanded in scope and now offers distance learning programs, including an online master's in health informatics. The health informatics program requires students to complete 39 credits, or 13 courses. Students can complete a thesis track or a non-thesis track which replaces the thesis requirement with an internship. Noteworthy courses include health data structures, eHealthcare information systems, decision support in healthcare, and health informatics project design and management. The program delivers all coursework asynchronously without in-person requirements. Applicants need an undergraduate GPA of 3.0 with prerequisite coursework in computer programming and statistics. Applicants must also submit GRE or GMAT scores. The school accepts students in the fall and spring semesters. The university offers several scholarships for students in health informatics and information management programs. ECU is regionally accredited by the Southern Association of Colleges and Schools Commission on Colleges (SACSCOC). The health informatics program is the only one in North Carolina that holds national accreditation from the Commission on Accreditation of Health Informatics and Information Management (CAHIIM). The second-largest campus in the University of Massachusetts System, UMass Lowell offers a variety of programs across disciplines. In recent years, the university expanded its distance learning offerings, now providing several online degrees, including an online master's in health informatics. Catering to working professionals, the health informatics program allows students to earn the degree without campus visits. The program delivers all coursework asynchronously, allowing students to structure their schedules around professional and familial obligations. The curriculum consists of 36 credits, including a 12-credit concentration in informatics. Notable courses include healthcare database design, healthcare project management, law and ethics in healthcare, and healthcare finance. During the final semester, students complete an independent study research project as a capstone experience. Applicants must submit GRE scores unless they hold a relevant degree with a minimum 3.5 GPA. The university reviews applications on a rolling basis, but students may only begin studies at the start of the fall or spring semester. Online students enjoy an in-state tuition rate regardless of residency. The University of Massachusetts Lowell is regionally accredited by the New England Association of Schools and Colleges (NEASC). Based in Houghton, Michigan Technological University was established to train engineers to work in local copper mines. The university since expanded to various STEM-related and business-related fields, now offering over 130 programs through five schools. The school offers a master of science in health informatics online, and the Center for Online Education ranked it as the 17th-best health informatics master's degree in the nation. The health informatics program enrolls 73% of students on campus and 27% of students online. Students can choose between three curricular options: thesis, coursework, or report (independent study project). Each option shares the same core coursework but culminates in a different experience. Notable core courses include healthcare data informatics and visualization, imaging informatics, and healthcare information security and privacy. Applicants need a bachelor's degree in a relevant field with a minimum 3.0 GPA. Applicants do not need to submit GRE scores. The school accepts applications on a rolling basis, but students should submit applications at least one semester before they apply for funding opportunities. Michigan Technological University is regionally accredited by the Higher Learning Commission (HLC). A Roman Catholic and Jesuit university founded in 1851, Saint Joseph's University operates a central campus in Philadelphia. The school offers extensive distance learning programs to working professionals, including an online master's in health informatics. Awarding a master of science in health administration with a concentration in informatics, SJU's program requires students to complete 36 credits to graduate. The informatics concentration consists of four required courses: healthcare and the internet, health information management systems applications, health information management systems data and infrastructure, and computer-based patient records. To provide accessibility to working professionals, the online version of the program delivers all coursework asynchronously without in-person requirements. The program waives its application fee for applicants who complete the application's requirements within 20 days. The program accepts students on a rolling basis. The admissions committee prefers applicants with professional experience in healthcare administration, but it does not list work experience as an official prerequisite. To support distance learners, SJU provides online students with a dedicated adviser who assists with scheduling, course planning, and academics. Saint Joseph's University is regionally accredited by the Middle States Commission on Higher Education (MSCHE). A private, Roman Catholic-affiliated college based in Fairfield, Connecticut, Sacred Heart University holds the distinction as the first American Catholic university to employ laymen as faculty and staff. The school offers several programs through distance learning, including an online master's in health informatics. The health informatics master's program requires students to complete 36 credits by taking courses part time, a process that generally takes two years. The program's part-time coursework and asynchronous delivery method allow students to work full time while completing the degree. The program does not include any in-person or on-campus requirements. Notable core courses include healthcare industry and policy, health information exchange, effective communications, and workflow design and reengineering. The curriculum culminates in a required capstone research project. The program describes the admissions process as "competitive." The program offers graduate assistantships to certain students to ease the burden of tuition. Online students pay in-state tuition regardless of residency. Sacred Heart University is regionally accredited by the New England Commission of Higher Education (NECHE). SHU also maintains an affiliation with the Healthcare Information and Management Systems Society (HIMSS). Established in the mid-1800s, Oswego experienced several iterations before becoming a liberal arts college and member of the State University of New York System. As the only SUNY campus to offer a software engineering degree, Oswego maintains a reputation for forward thinking in education. The school offers several distance learning programs, including an online master's in health informatics. The health informatics curriculum requires students to complete 33 or 36 credits and usually takes two years to finish. Students choose one of three tracks: health information management: health data science, health informatics: intelligent health systems, or health informatics: professional. Regardless of track, students complete core courses, such as eHealth systems and health informatics methods. Delivering coursework asynchronously without in-person requirements, the health informatics program allows students to work full time while completing their degree. The program accepts applications on a rolling basis and allows students to begin their studies in the fall, spring, or summer terms. All students in the online health informatics program pay the same tuition rate regardless of residency. SUNY Oswego is regionally accredited by the Middle States Commission on Higher Education (MSCHE). UC, based at the school's main campus in Cincinnati, Ohio, offers a part-time, fully online master's in healthcare informatics program. Students can complete the web-based program in two years. The program offers six start dates per year (two dates per academic semester). The program does not require applicants to submit GRE or GMAT scores, nor does it require applicants to possess prior professional experience in information technology (IT) or healthcare. Students may also complete the program's security certification. The certification requires nine additional credit hours of elective coursework. UC is regionally accredited by the Higher Learning Commission (HLC). Concordia offers a fully online master of healthcare administration with a concentration in health information technology (HIT). Although the main campus is located in the small town of Seward, the graduate school resides in the state's capital city, Lincoln, roughly 25 miles southeast of Seward. The school, founded through the Lutheran Church-Missouri Synod in the late 19th century, is a private institution. The program offers a multifaceted curriculum that blends healthcare administration with information technology, making it one of the best health informatics master's programs online for students interested in both disciplines. Online students learn how to use healthcare data to increase the quality of patient care, focusing on issues of safety, finance, leadership, and security. Students earning the health informatics master's degree online complete 12 courses for a total of 36 credit hours. All online graduate courses last eight weeks. Students who have completed coursework at another accredited school may transfer up to nine qualifying credits toward the HIT master's degree. Students without transferable hours typically complete the program in two years. Students complete 24 credits of core coursework in the master of healthcare administration. Core courses include management of healthcare organizations and health law and ethics. The health informatics concentration consists of three additional required courses, totaling nine credit hours. These courses include health informatics, healthcare systems with leadership implications, and cybersecurity. Concordia is regionally accredited by the Higher Learning Commission (HLC). Based in Pittsburgh, Chatham boasts two campuses and a rich history that dates back to the mid-19th century. Although founded as a women's college in 1869, the school now operates as a coed institution that matriculates more than 2,000 students. Designed for professionals already working in healthcare, business, or information technology fields, the school's master of healthcare informatics offers a flexible online program to help students advance their career. Chatham also offers online certificates in healthcare informatics and healthcare analytics. Certificates consist of four courses. Students can apply certificate credits toward the master's degree in health informatics. After the first semester, students pursuing the master of science in health informatics online can compete for the Dr. Wolf Healthcare Informatics Student Award. Each year, the program recognizes two students with the $500 award. Applicants must submit an essay addressing a prompt and a letter documenting their community involvement. Chatham offers a sample course, complete with mock assignments and a discussion board, for prospective students to gain an understanding of how online learning works at the school. Chatham is regionally accredited by the Middle States Commission on Higher Education (MSCHE). Located in the northeastern corner of Pennsylvania, Misericordia is a Catholic institution that offers several online degrees, including an online master's in healthcare informatics. The school boasts a low student-to-faculty ratio of 11-to-1, ensuring that each student receives personalized support. Students in the master's in health informatics degree online complete 36 credits of coursework. Students access coursework asynchronously through Blackboard, completing assignments at their own pace. Distance students unfamiliar with Blackboard can receive training on how to use the digital learning platform. To provide additional support to online learners, faculty members in the health informatics department set aside time each week to digitally meet with distance students. These meetings allow online students to check in, ask questions, and develop a greater sense of connection with instructors. Students begin their studies with 10 required courses. The program differs from many health informatics programs in that students choose between an academic or professional track after completing core requirements. Both tracks include a health informatics research course. Students in the academic track pursue a thesis. Students in the professional track complete a professional contribution. The professional contribution can involve a clinic-based project, a presentation within a professional context, or another comparable hands-on experience. Misericordia is regionally accredited by the Middle States Commission on Higher Education (MSCHE). The online master of science in health informatics at Northeastern in Boston features a fully online curriculum. The program draws from the Bouvé College of Health Sciences and the Khoury College of Computer Sciences, blending faculty with backgrounds in healthcare and information technology (IT). Graduates of the program work as leaders in the healthcare IT industry. The program boasts a healthy job placement record; within six months of earning the degree, nearly 100% of graduates found employment. Alumni work at reputable healthcare institutions, such as Boston Children's Hospital, Partners Healthcare, Blue Cross Blue Shield, and Athena Health. Students also complete a capstone project of their design. The requirement encourages students to perform a community-based project that advances the field of health informatics. Students pursue the project alongside health informatics professionals under the supervision of a faculty member. Students in the online health informatics program can bolster their resume by earning a graduate certificate in data analytics. Courses in the certificate program overlap with those in the MS in health informatics. Students can begin their studies in the fall or spring semester. Applicants submit academic transcripts, a statement of purpose, three letters of recommendation, and a professional resume. A Catholic institution based in Duluth, Minnesota, CSS offered the country's first health information program in 1935. Students can now earn the master of science in health informatics fully online. The program emphasizes the importance of community, stewardship, and respect. Designed for working professionals, students can complete the online master's through two learning platforms: online courses and virtual classrooms. Online courses rely on dynamic learning tools, such as discussion boards and interactive presentations. Virtual classrooms occur synchronously through Zoom, a virtual conferencing service. Zoom allows students to connect through video and audio chat while using additional tools, such as polls and chat rooms. Distance learners receive extra support, including individualized advisers. Online graduate students enjoy access to the same amenities as their on-campus peers, including tutoring services and student community groups. Students can also earn a health informatics certificate online. Upon completing the program, students can apply the certificate's 18 credits toward the master's degree. Applicants to the program must hold a bachelor's degree from an accredited institution and submit transcripts showing a cumulative GPA of 3.0 or above. CSS is regionally accredited by the Higher Learning Commission (HLC). Based in Chicago, DePaul's unique online master's in healthcare informatics allows students to explore a variety of specializations. Students can specialize in innovations in healthcare, health information management, database processing, enterprise management, security management, or health analytics. Each specialization offers unique elective courses. Students can also mix and match courses based on their interests and professional aspirations. To graduate, students must earn a minimum of 52 graduate credit hours and maintain a GPA of 2.5 or above. Students interested in the administrative side of healthcare can explore courses outside of the program. In 2012, DePaul partnered with Rosalind Franklin University to encourage creative curriculum design and multidisciplinary collaboration. Today, students earning the online health informatics degree at DePaul may take courses in Rosalind Franklin University's master of science in health administration program. The courses count toward the health informatics degree at DePaul. Online learners complete the same assignments as their on-campus peers and adhere to the same academic deadlines. Distance students enjoy around-the-clock online access to course materials, including whiteboard notes and video recordings of lectures. Distance students take tests under the supervision of a local proctor. DePaul is regionally accredited by the Higher Learning Commission (HLC). Established as a Jesuit institution in the late 19th century, Scranton now ranks as the sixth best regional school in the North, according U.S. News & World Report. The university offers several online degrees, including an online master's in health informatics. Housed under the Panuska School of Professional Studies, the program offers a blend of professional training and liberal arts coursework. The program draws from experienced faculty in the College of Arts and Sciences, the Panuska School of Professional Studies, and the Kania School of Management, providing a multidisciplinary curriculum that covers topics in business, technology, and communication. Students also choose an elective course. Elective courses cover topics such as rural health, long term care administration, hospital management, and end-of-life care. The program culminates in a three-credit capstone project. Although the program encourages students with a background in information technology or healthcare to apply, it also offers one-credit foundational modules for students without relevant professional experience. Students can complete these modules in computer information technology for health professionals or introduction to healthcare. Scranton is regionally accredited by the Middle States Commission on Higher Education (MSCHE). Founded in 1841 and located in Birmingham, Alabama, Samford serves as one of the state's best higher education institutions. In 2019, U.S. News & World Report ranked the school as the fourth best regional university in the South. Today, it enrolls more than 5,000 students and offers a variety of undergraduate and graduate programs. The university's School of Public Health offers an online master's in health informatics. Students can enroll in the program full or part time. Full-time students complete the program in under two years, taking courses in the fall, spring, and summer. Full-time students typically complete three courses per semester. Part-time students complete the program in 2.5 years, including summer semesters, taking two courses per semester. Students earning the master of science in health informatics online complete two in-person residencies, one at the beginning of the program and one at the end. These visits take place on the school's campus in Birmingham. Otherwise, coursework occurs online and covers topics like healthcare ethics, current topics in health/biomedical informatics, and healthcare information technology project management. Students also complete an elective course and a capstone project. Applicants must submit GRE, GMAT, or MAT scores. Applicants with at least three years of relevant professional experience may request a test score waiver. Applicants must also submit three letters of recommendation, transcripts demonstrating a minimum 2.0 GPA, and a digital video interview. Samford is regionally accredited by the Southern Association of Colleges and Schools (SACS). Founded by Baptists in the early 19th century, Mercer now identifies as a private, nonreligious liberal arts school. It boasts 12 colleges and schools and a student body of more than 8,000. With campuses in Atlanta, Savannah, and Macon, the school also offers a selection of fully online degrees. The school designs many of its programs to support working professionals, offering students the choice of over 65 programs delivered either in the evenings, in hybrid formats, or online. Designed for students already working in a field related to healthcare or information technology, Mercer's fully online health informatics master's helps professionals advance their career. Based out of Mercer's Penfield College, online students meet in virtual classrooms and use digital tools like Moodle, Canvas, wikis, and blogs to connect with instructors and peers. Students take exams under the supervision of a local proctor. The program offers two start dates, in January and in August. The program does not require GRE scores. Applicants must submit transcripts, one letter of recommendation, a resume, and documentation of relevant professional experience. The application also involves an interview component. Mercer is regionally accredited by the Southern Association of Colleges and Schools (SACS). Based in Fort Lauderdale, NSU offers a unique online master of science in biomedical informatics ideal for working professionals. In addition to web-based coursework, students in the online biomedical informatics program complete a hands-on practicum at a local hospital, clinic, or healthcare organization. To graduate, students complete 15 courses totalling 44 credits. Required credits include 32 required course credits, 12 elective credits, and additional suggested coursework if necessary. Elective courses explore niche topics, such as epidemiology, grant writing, consumer health informatics, medical image processing and analysis, and artificial intelligence in healthcare. Suggested coursework includes four one-credit courses that cover introductory topics, like medical terminology and foundations of software in healthcare. Students without relevant professional or academic experience may take these courses to bolster foundational knowledge. Applicants may apply at any point in the year and begin their studies in the fall, winter, or summer semester. Eligible candidates must hold a bachelor's degree with a minimum 3.0 GPA. Desirable candidates boast additional experience in biomedical science or a degree in a health-related discipline. Applicants submit official transcripts, one letter of recommendation, and a $50 nonrefundable fee. The school requires international students to prove their English proficiency, either through standardized testing or by submitting transcripts from an approved bachelor's program. NSU is regionally accredited by the Southern Association of Colleges and Schools Commission on Colleges (SACS). The UIC is made up of 15 colleges across five regional campuses and online. The school's College of Applied Health Sciences offers a fully online master's in health informatics. Unlike many other master's in health informatics online programs, students can earn the degree through a coursework-only track or through a track that involves research or a project component. Students can also specialize in health data science. Before starting coursework, students complete two prerequisites: foundations of health information management and medical terminology for health information management. Students with prior medical knowledge may take a proficiency exam to test out of the latter course requirement. Students in both tracks complete 28 credit hours of required core coursework. Students in the coursework-only track complete nine credit hours of elective courses and a one-hour capstone experience. Students pursuing the health data science concentration take two required courses and two electives related to the subject. Students pursuing the research track must declare their intent within eight weeks of beginning the program; they must also hold a GPA of 3.5 or better. Students in the research or project track complete a course on strategic inquiry in biomedical and health information sciences, a seminar, and a project or thesis. Research students carry out their investigations under the supervision of a faculty member. Accreditation: UIC is regionally accredited by the Higher Learning Commission (HLC). The master of science in health informatics program is fully accredited by the Commission on Accreditation for Health Informatics and Information Management Education (CAHIIM). With a student body of over 24,000, Drexel is one of the country's largest private institutions. Based in Philadelphia, the school serves students worldwide through its campuses, foreign research partnerships, and online programs. Housed within the College of Computing and Informatics (CCI), the online master of science in health informatics draws from partnering colleges, including the Dornsife School of Public Health, the LeBow College of Business, and the College of Nursing and Health Professions. The college also offers a certificate in healthcare informatics. Students who are unsure if they want to pursue the master's can start with the certificate and later apply certificate credits toward the master's. Students can enroll in the program part or full time. Drexel also offers a dual degree option, in which learners can combine the health informatics degree with any other graduate program offered by the CCI. Conversely, students earning the master's in healthcare informatics can pursue a graduate minor in another related field, such as business, public health, or nursing. Graduate minors typically require 3-4 additional courses within the supplemental field. The program requires 45 credits of required courses and electives. Required courses cover foundational topics. Students also complete a hands-on health informatics experience. Elective courses explore a variety of subtopics, including social network analytics, the design and analysis of epidemiological studies, and data mining. Drexel is regionally accredited by the Middle States Commission on Higher Education (MSCHE). The master of science in health informatics program is fully accredited by the Commission on Accreditation for Health Informatics and Information Management Education (CAHIIM). The University of Mississippi, known to many as Ole Miss, serves a student body of 24,000. To accommodate an expanding population of learners, the school offers a selection of online degrees, including a fully online master's in health informatics and information management. The degree falls within the School of Public Health Professions, which operates under the university's Medical Center. To apply, students submit GRE scores, a resume, an essay, and documentation of at least a 3.0 GPA for the final 60 hours of a bachelor's degree from a regionally accredited institution. Students apply in the spring to begin studies in the fall. Ole Miss is regionally accredited by the Southern Association of Colleges and Schools (SACS). The program's health informatics track is fully accredited by the Commission on Accreditation for Health Informatics and Information Management Education (CAHIIM). Founded in 1866, Roberts is a private, Christian college offering a variety of professional and liberal arts degrees to nearly 2,000 students. In addition to courses on its Rochester campus, the school offers a few fully online programs, including an online master of science in healthcare informatics. Applicants need a bachelor's degree with a minimum 2.75 GPA and two years of professional experience in healthcare. Ideal candidates hold a bachelor's degree in an area related to health informatics, such as business, information technology, or pre-med. Applicants without professional experience may also apply, provided that they complete an interview with the program director. Applicants do not need to submit standardized test scores. Because the program's coursework progresses sequentially and each cohort advances through the program together, students may not transfer credits from another institution. However, students with qualifying credits can apply for the Advanced Standing Scholarship that covers the cost of tuition for any redundant courses they must complete. Roberts is regionally accredited by the Middle States Commission on Higher Education (MSCHE). Founded a decade before the U.S. became an independent nation, Rutgers serves as one of the oldest universities in the country. The school hosts campuses in New Brunswick, Newark, and Camden. It also offers several web-based degrees, including a fully online master of science in biomedical informatics. The unique program, housed within the School of Health Professions, allows students to specialize in public health informatics, hospital management informatics, bioinformatics, or clinical informatics, further qualifying graduates for niche jobs within the field. The 36-credit program consists of core coursework, electives, specialization courses, and a culminating thesis or project. In the final thesis or project, students identify and research a current gap of knowledge in biomedical informatics, create a plan to address this gap, and present their findings. The school also offers a certificate in healthcare informatics. The certificate consists of three core courses within the master's program and three electives. Students can apply these credits toward the master's in biomedical informatics. The program does not require GRE scores, but applicants need a 3.0 undergraduate GPA in a relevant subject, such as computer science, engineering, or health science. Applicants to the master's and certificate programs must submit official transcripts, three letters of recommendation, a CV or resume, and a personal statement. The school offers a limited number of academic scholarships to qualifying students. Rutgers is regionally accredited by the Middle States Commission on Higher Education (MSCHE). A master in health informatics degree prepares students to pursue various professional positions in the health informatics field. Health informatics graduate programs typically utilize an interdisciplinary approach, incorporating fundamental components of health informatics, health sciences, and information technology alongside business and management principles. Students in these programs learn the fundamentals of information technology, healthcare, and management. Programs typically cover subjects such as medical information systems security, data architecture and modeling, healthcare information systems, legal issues in health medical informatics, and health data and electronic health records. Some programs provide specializations such as clinical informatics and health administration informatics. Students pursuing an online master's in health informatics earn the same degree as their on-campus peers, but their educational experience will likely differ. Most online degrees, for instance, offer courses asynchronously, meaning that students do not need to log in for class at certain times. Instead, they study in the evenings, before work, on the weekends, or whenever feels most convenient for them. Some courses may require interactive assignments that students complete in groups. Typically, a group simply selects the time that works for all members to meet together. Weekly reading assignments, threaded discussions, essays, and other coursework usually get posted in a special section of the class, making it easy for students to submit homework assignments. Rarely do learners email assignments directly to professors; instead, most schools use a turn-it-in system that tracks student submissions. Successful online students enter the program with some professional experience behind them. They thrive in this environment because it mirrors their independent work responsibilities. Online students need to maintain momentum in their courses and the program as a whole in order to succeed. Careers in health management continue to grow due both to a population boom among senior citizens and recent public policy changes that changed the financial structure of healthcare. Earning a master's degree in health informatics can pave the way for advanced technical and leadership positions. Professionals with a bachelor's degree in the field may pursue health informatics jobs such as clinical informatics specialist, medical database administrator, or medical records and health information technician. By pursuing a graduate degree, however, students can strive for jobs in information security management, data analytics, consulting, and technology leadership. According to a recent study, members of the American Health Information Management Association who hold a master's degree enjoy better job placement rates than those with only a bachelor's degree; members with a doctorate enjoy an even higher placement rate. The career and salary information below demonstrates the value and opportunities a master's degree in healthcare informatics can offer. Individuals with a master's degree in health informatics can pursue careers set in public health organizations, hospitals, health associations, pharmaceutical companies, and insurance companies. Individuals with a master's degree in health informatics apply their knowledge of the scientific and technical aspects of health informatics in managerial and administrative positions. Chief Technology Officer: A CTO focuses on the scientific and technological components of the organization's work. CTOs typically boast a robust educational background in technology, business, software engineering, and finance. Compliance Auditor: Sometimes called a certified medical auditor, compliance auditors assure that a healthcare office remains compliant with regulatory requirements. Auditors review billing statements, clinical documents, coding data, and other documentation. Information Systems Analyst: Usually serving in the information technology department of a healthcare setting, these professionals analyze and design information systems that meet the needs of healthcare managers and providers. Healthcare Consultant: Working in hospitals and other large-scale healthcare settings, consultants provide management expertise on structure, staffing, technology, and profits. They typically hold master's degrees in healthcare-related areas. Healthcare Informatics Specialist: These professionals design and implement strategies for collecting, standardizing, and using data in healthcare settings. This role goes beyond healthcare information since it emphasizes analysis over data collection and thus often requires a master's degree. Individuals with a master's degree in health informatics may earn the registered health informatics administrator (RHIA) certification. Offered by the American Health Information Management Association (AHIMA), this certification provides health informatics professionals with a recognized stamp of excellence, which can help in pursuing or advancing careers in the field. Individuals who earn the RHIA certification show they can meet the rigorous professional standards of the AHIMA. Generally, prospective students should take their time when choosing the right program for them, carefully weighing the pros and cons of each option. Many factors go into selecting the right program. Cost and financial aid, for example, often serve as major considerations for students, and in-state programs often present a more affordable option than out-of-state ones. For other students, program length or even a school's programmatic focus may prove a critical concern. After deciding on the factors most important to them, students can identify the online schools that fit their exact needs. Program Cost: The cost of clinical informatics master's programs can vary from $700 per credit hour to more than $4,000. Prospective students also need to consider ancillary costs such as fees, travel, books, and technology. Some expensive schools may offer larger financial aid packages that make their programs more affordable, so students should add up the full cost of each option before enrolling. Transfer policies: Students who already hold graduate credits in the field may want to consider finding a school with a transfer policy that allows them to count those credits toward their degrees. Not all master's in healthcare informatics programs accept credits earned in other programs, but a liberal transfer policy can help prospective students save time and money. School Size and Type: Prospective students can evaluate schools across the country to determine which one best meets their needs. Some institutions emphasize small class sizes while others promote their large alumni base; still others affiliate with faith-based traditions or are non-sectarian. Public schools often charge lower tuition rates than private schools but may not hold the same perception in the public eye. Program Length: A health informatics master's degree can take as few as 30 credits or as many as 50 credits to complete. Full-time students should expect to take 2.5 years to complete their degrees, although some accelerated programs allow learners to finish in just 18 months. Part-time students or those pursuing a dual master's degree may need five years. On-Campus Requirements: Some institutions offer their degrees entirely online while others expect students to attend on-campus experiences for long weekends or even 1- to 2-week sessions. While these in-person events can build camaraderie amongst students and provide valuable face-to-face time with professors, they can also take learners away from work and family responsibilities. Students usually need to pay for transportation and room and board while on campus. Thesis, Fellowship, and Work Requirements: Internship and final project requirements vary by school. Some institutions expect students to conduct pure or applied research while others focus on the value an internship or fellowship can bring. Prospective students who know what they want from their informatics degree can choose the program that best aligns with their aspirations. When selecting a master's in healthcare informatics, prospective students should ensure that the degree they choose enjoys recognition from the right accrediting agencies. In the U.S., accreditation represents a voluntary process that schools undergo in order to demonstrate that they meet or exceed minimum standards of quality, and that they commit to continuous improvement and evaluation. Accreditation can be regional, national, or programmatic. Regional associations serve as the gold standard in higher education, and these organizations accredit entire colleges or universities. Anyone seeking a healthcare informatics degree should choose a school that holds regional accreditation to take advantage of the most financial aid options and to ensure their degree's utility in the real world after graduation. In addition to regional accreditation, many schools seek programmatic accreditation for specific departments or degrees within the institution. The Commission on Accreditation for Health Informatics and Information Management Education provides programmatic accreditation for a clinical informatics degree. All legitimate accrediting bodies in the U.S., whether regional, national, or programmatic, hold membership in either the Department of Education (ED) or the Council on Higher Education Administration (CHEA). Prospective students should check any school's accrediting agency against the membership lists that CHEA and the ED provide. 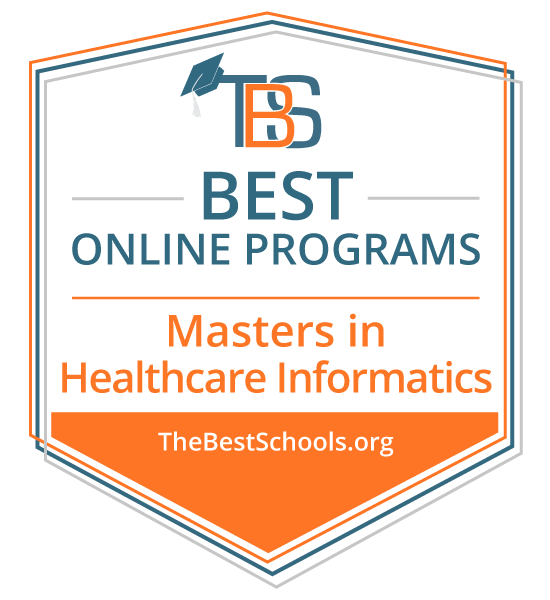 How Long Does It Take to Complete an Online Master in Health Informatics Degree? Typically the program takes full-time students about 2.5 years to complete; however, students can complete some programs in 18 months or fewer. Students get exposed to infectious disease epidemiology's scope and practice through this course. They study topics like epidemiological history and vocabulary, disease surveillance, laboratory diagnosis, molecular epidemiology, and assessment of vaccine field effectiveness. The course also includes an introduction to global aspects of infectious diseases. This course emphasizes privacy, data security, and the confidentiality of health information. Students focus on information technology and management, including such topics as information security, risk management, and data integrity and validity. The course also includes a component on creating and implementing data and service delivery disaster recovery plans. Students enrolled in this course study topics such as inference for mean vectors, analysis of covariance structure, the multivariate normal distribution, discriminant analysis, and factor analysis. Learners also receive an introduction to the most useful statistical methods and models in multivariate data analysis. Focusing on using healthcare vocabularies, terminologies, and classification systems, this course helps students identify their best sources and uses before applying them in health information systems. The ultimate goal for students leaving the course is to know how to promote effective data integrity and communications. Students in this course receive an introduction to the practical applications of descriptive and inferential statistics as used in healthcare settings. Learners analyze real-world data to formulate a data procurement plan. Moreover, students learn how to distribute published health research data and how to apply new knowledge within their industry. Professional organizations are a great way for health informatics professionals to network with each other, read the latest research, access career centers, and take continuing education classes. Members can take advantage of the opportunity to publish their own articles or speak at association events, elevating their standing in the bioinformatics industry. International Medical Informatics Association: IMIA serves the global healthcare informatics and bioinformatics research communities as a bridge organization that spans theory and practice. IMIA publishes four journals: Applied Clinical Informatics, Informatics for Health and Social Care, International Journal of Medical Informatics, and Methods of Information in Medicine. Healthcare Information and Management Systems Society: Dedicated to the health information community, HIMSS represents more than 70,000 people, 600 corporations, and 450 nonprofit organizations. Individual members can participate in local chapters and special interest groups; plus, they enjoy access to members-only content and discounted pricing on conferences. American Nursing Informatics Association: Made up of more than 3,000 nurses and other health informatics professionals, ANIA integrates nursing practice with information science. Members enjoy an annual conference, regular educational webinars, access to the Journal of Informatics Nursing, and review courses for Nursing Informatics Certification exams. clinical research informatics, clinical informatics, consumer health informatics, and public health informatics. Members can take advantage of an online community, webinars, events, and a peer-reviewed scientific journal. American Health Information Management Association: Founded in 1928, AHIMA serves as the professional home to 103,000 health information professionals. The organization offers 10 professional certifications plus courses, webinars, books, conferences, and a virtual lab for experiential learning. Student members can get help in planning their education and their job search.